American Copper Buildings from under the FDR Drive, December 11, 2017. Did you know that what the skyline needed was a cross between all-in 1960s corporate branding, the Downtown Athletic Club as described by Rem Koolhaas and a lair worthy of Goldfinger? I didn’t, but it did, which is why SHoP’s fraternal-twin, 761-unit rental towers are our 2017 Building of the Year. We’ve been watching for some time as the copper-clad north and south sides of the two towers, zigzagging within their ho-hum zoning envelopes, rose. First, they were as shiny as copper pennies, then they went dark and streaks appeared, including a stripe of verdigris. “Eventually the whole thing will be Statue of Liberty green,” says SHoP principal Gregg Pasquarelli. 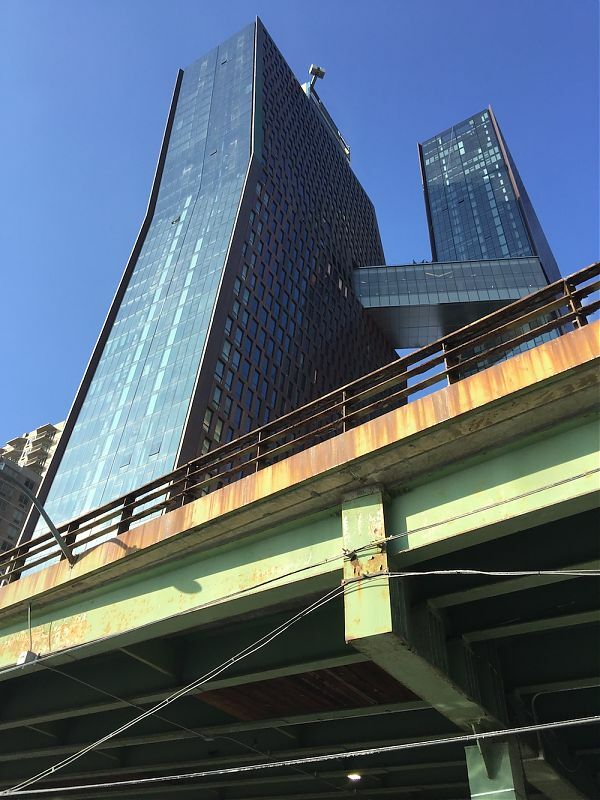 “We thought of it as a performance art piece viewed from the FDR Drive.” While other Jenga-inspired skyscrapers already seem old hat, these can still surprise us.